Medusa the Mean is the eighth book in the Goddess Girls series, and the second book in the series I have read. In the first few books the more popular goddess girls are the main characters – Athena, Artemis, Aphrodite and Persephone. Later in the series other characters get some spotlight time too. 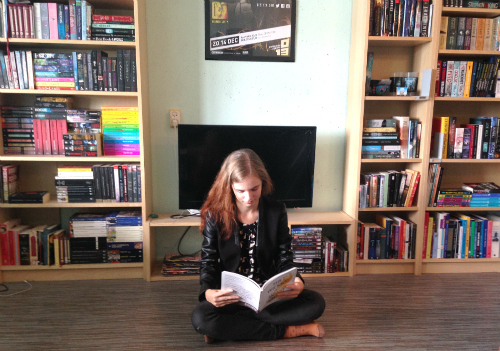 I was very much excited to be reading about Medusa. She always seems so mean and evil, so it was great to see inside her head for a while. Medusa the Mean really upped my appreciation for Medusa. In spirit she’s just a scared girl that wants to be accepted for who she is. The authors really handled Medusa’s story beautifully; I was impressed how they found a good balance between Medusa’s bitchy-ness and her more vulnerable inner monologue. Having read the first book, Athena the Brain and the eighth book, Medusa the Mean, close to each other, it was easier for me to spot the differences between the books and the evolution of the series in general. The most obvious difference is the length – Medusa the Mean is significantly longer. This is also felt within the story, as the storyline in Medusa the Mean uses more built-up and time to develop than the slightly random adventures displayed in Athena the Brain. Medusa’s book is lot more coherent and follows the more classic plot structure. In Athena there is a lot of creative use of myths and little word jokes. There is quite a bit less of that in Medusa, even though there is still more than enough mythology to keep the story interesting. 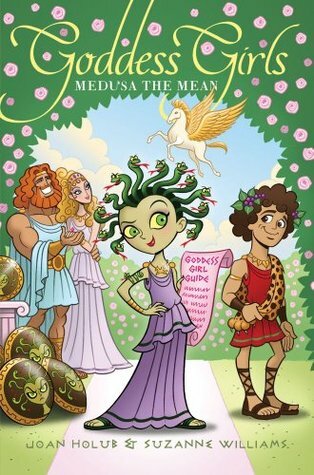 Medusa the Mean is a solid addition to the Goddess Girls series that fans of the series will eat up. It’s lovely to get an insight into the life of Medusa. Recommended for anyone looking for a fun, light, and clever MG read.